I was supposed to get a tour of the Hanford B Reactor this past weekend, but wildfires had closed the area and the tour was rescheduled for October. We still got a peek at blueprints of the plant, and volunteers were on hand to answer questions. 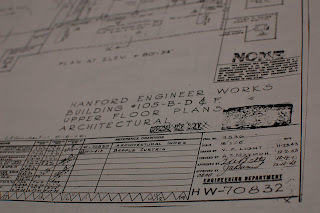 Note the date of these plans: November 1943. They specify the reactor core vaguely as the "process area" with suspiciously thick concrete walls.